Meanwhile, back in the states, high-school student Kenny (Michael Rainey, Jr.) in the midst of rather inexplicably making a cell phone video of himself entering the boy’s bathroom, is waylaid by three punks, one of whom tries to put his head in a urinal. Kenny is meek and Kenny is mild, but he gets off a fortunate punch just as an adult is walking in, and is sent to the principal’s office. As punishment, Kenny has to do a “ride along” with some cops in his relatively crime-free Massachusetts neighborhood. 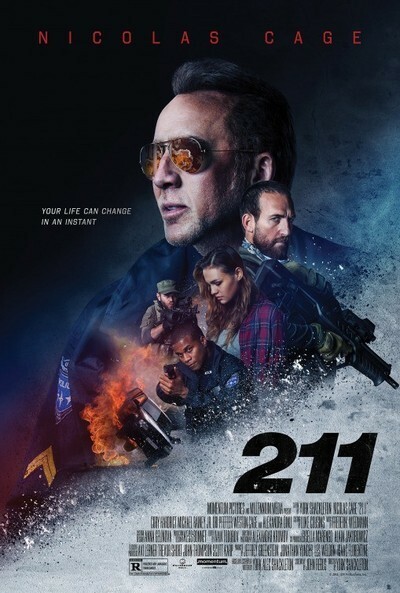 One of those cops is Nicolas Cage, playing Mike Chandler, a Bitter Man In Widowhood Who Has Forgotten Why He Even Joined The Force. Mike’s partner is his son-in-law, Steve, who the morning of the ride along learns that his wife, Mike’s daughter, is pregnant with their first child. By now you’ve probably guessed the location of the bank that the beardo mercenaries are gonna try to knock over, at which they will claim their prize of—this is great—ONE MILLION DOLLARS. Seriously, with all the explosives and weaponry these bozos have with them, the seed money for the heist had to have been half that. These super professional dudes roll into town screaming and cussing and doing the high-volume thing that most movie bank robbers know not to do, which is overtly call attention to themselves. Seriously, haven’t any of these idiots seen “The Friends of Eddie Coyle”? It is fated that Disillusioned Cop, Disillusioned Cop’s Son-In-Law, and Innocent Ride Along Kid must confront this evil, and so they do. This movie has been variously self-described as “in the vein of ‘Black Hawk Down’ and ‘End of Watch,’” and “based on the true story of one of the longest and bloodiest events in police history.” I guess the “Black Hawk Down” comparison derives from the many gaping wounds the characters and the extras suffer. I don’t know where the rest comes from; because all told this effort is a cavalcade of crap. Loud crap. The movie is mercifully brisk though; you don’t even get to work up a good head of steam against the villains, which may leave you feeling empty by the movie’s end.